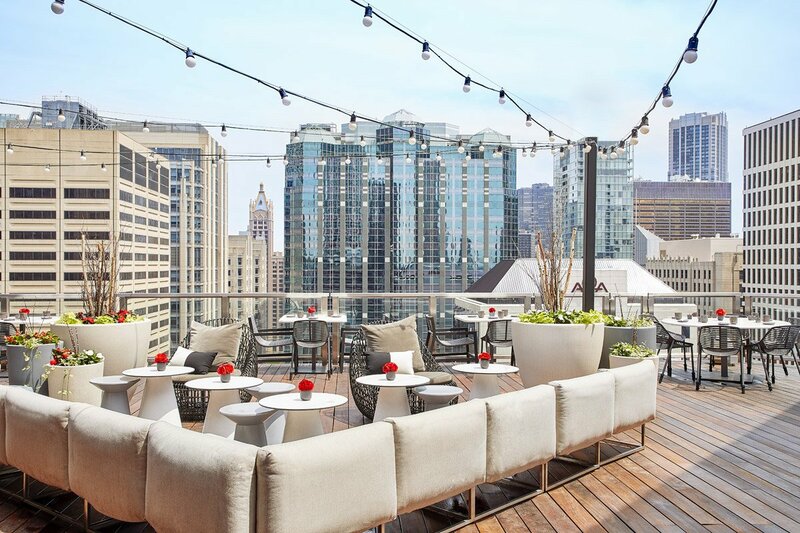 Have a drink and take in the view at Noyane Rooftop Bar at Conrad Chicago. For all the talk about escaping the city in the summertime, there are so many reasons to stick around. Outdoor movies. Picnics in the park. Dining al fresco. Fireworks under the stars. Add to that list hotels to explore, because summertime is when the at their restaurants, rooftop bars, spas, pools, and entertainment experiences. To sweeten the offer, this summer, hotel guests can make the most of the many offerings with a $50 daily credit, good towards on-site options like Instagram-ready appetizers, virtual-reality cocktails, terrace views, and so much more. Don't Miss: The virtual reality cocktail experience at Baptiste & Bottle. The bourbon and whiskey bar located on the 20th floor of Conrad Chicago, known around town for its eccentric cocktail list and impressive house cellar, recently introduced a virtual reality experience. In the Macallan Rare Journey Cocktail, guests wearing a VR headset are transported to the Macallan Cooperage in Scotland, where they learn about the distillation process while simultaneously sipping Macallan Rare Cask, sherry, and whiskey. Don't Miss: Dishes so pretty, you'll almost feel guilty devouring them. At BRIO Brasserie, innovative and creative Panamanian gastronomy is masterfully prepared and even more beautifully executed, which might be the only thing that could distract you from the sweeping Panama City skyline views. Don't Miss: The perfect Instagram shot from Loopy Doopy Rooftop Bar. This is the rooftop bar that's everywhere on Instagram — in part for the spectacular harbor views and also for the photogenic Prosecco and Ice Pop, fruity popsicles served upside-down in a glass of prosecco or rosé. Don't Miss: A spa treatment (if you can choose only one). The offerings are extensive and impressive: massages, six different types of facials, hydration remedies and peels, full-body scrubs, manicures, pedicures, and couple- and maternity-focused wellness treatments. No need to pick just one: You get a new credit every day. Don't Miss: The legendary Sazerac Bar. Welcome to the epicenter of New Orleans, where you're moments from the French Quarter and the best of the city's dining and nightlife. The landmark hotel is a destination unto itself, from elegant Sazerac Bar and award-winning Domenica restaurant to live music in the Fountain Lounge and drinks in the rooftop bar. Revive and restore the senses at the Waldorf Astoria Spa, then do it all over again. It's the New Orleans way, after all.